I recently received a Twitter inquiry about the Oakland Athletics' uniform sleeve patch. The A's sport the symbol of an elephant on their uniforms, a visual association that dates back to the franchise's second season. Why an elephant? Hardly a symbol of athleticism, the Athletics' elephant has a unique story attached to it, one that dates back to July 10, 1902. 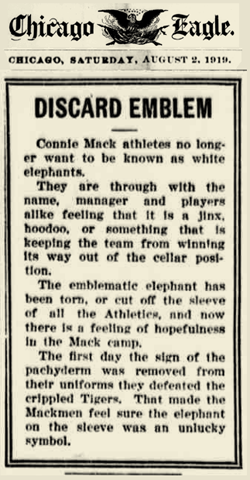 Athletics owner and manager Connie Mack explained it all in his 1950 autobiography, "My 66 Years in the Big Leagues:"
Research shows that McGraw made these remarks on July 10, 1902, and the elephant connection has endured, albeit with many twists and turns. The "white elephant" designation became a rallying point for the young franchise in 1902. It was already being described as "famous" less than three weeks after McGraw made his remarks. The Athletics responded by winning the American League championship that season, the final one before the birth of the modern World Series the following year. 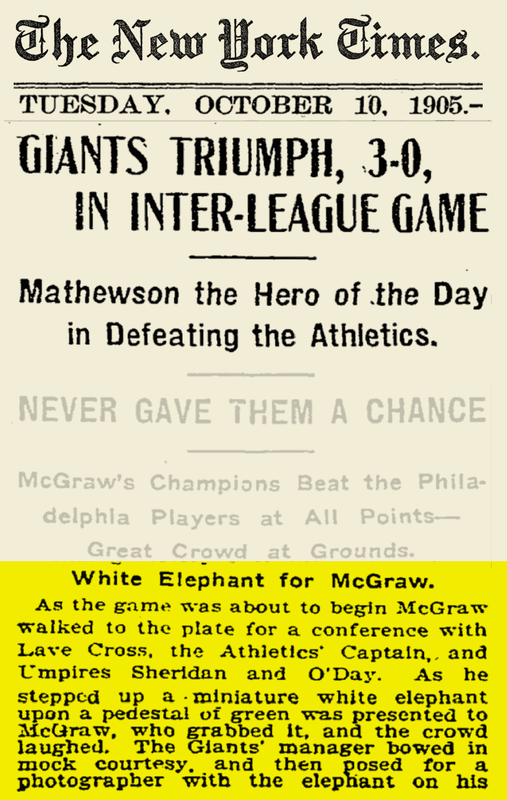 The team and their fans continued to embrace the symbol, and when they appeared in their first World Series in 1905—against John McGraw's New York Giants—they defiantly presented McGraw with a miniature elephant statue. Although New York won that World Series, "white elephant" and the Philadelphia Athletics were now strongly attached to one another, a bond that would literally follow the team across the United States as it moved twice—first to Kansas City in 1955, then to Oakland in 1968. The club formally adopted the elephant as a part of their visual identity in 1909, when they wore sweaters featuring a simple white elephant. The above logo dates to 1911 and was used by the team as part of their World Series press pin that season. It was also utilized on letterheads for many years. 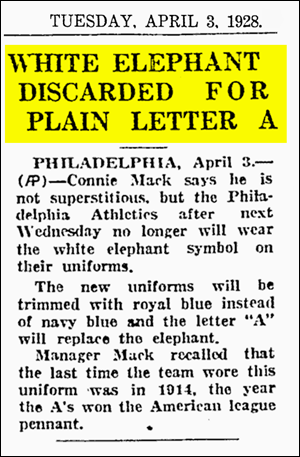 Whatever the case, in 1920, the elephant made it to the front of the team's uniforms. Three distinct elephant variations were utilized in this decade. The first was a one-year wonder, worn only in 1920. It featured a crudely drawn green pachyderm in a standing position. The 1921-23 version, rendered in blue, was a bit more detailed. Finally, the version worn from 1924-27 depicted the white elephant as a white elephant. This jersey is associated with a franchise renaissance. After a decade of insignificance the Athletics returned to contention, finishing in second place in 1925 and 1927. The seeds of a renewed A's dynasty were sown at this time. The 1928 team featured no less than seven future Hall of Fame players—plus Connie Mack, a future Hall of Fame manager. The team would win three straight pennants from 1929-31 and would come to be recognized as one of the great dynasties in the history of the sport. Perhaps anticipating this return to dominance, the club reverted back to their iconic Old English "A" uniforms for the 1928 season. Though still a big part of the visual identity of the franchise, the elephant would not make a return to the team's uniforms for more than two decades. The team's elephant symbol evolved. When the Athletics appeared in the 1931 World Series, the cover of the official program depicted a confident elephant, a saddle on its back with the familiar Old English "A." This illustration became the basis of what would eventually become the team's official logo. In the late '30s a baseball was added to the elephant's trunk. 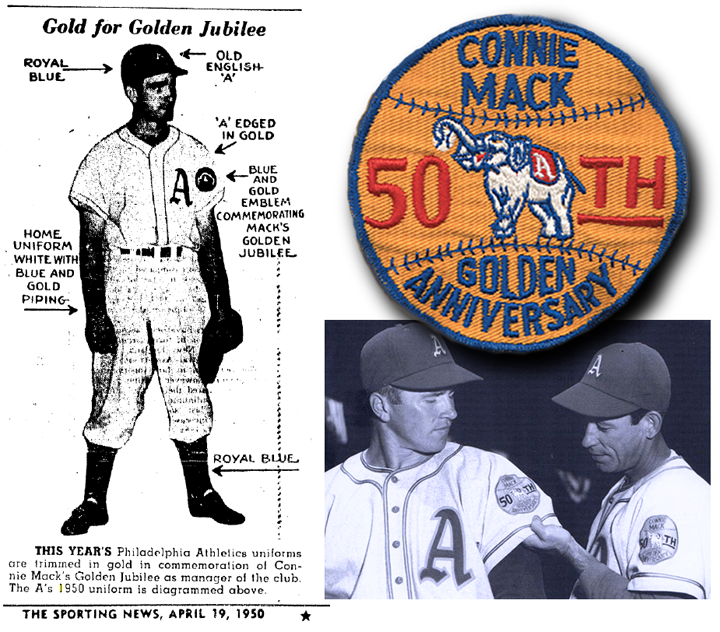 1950 marked the golden anniversary of Connie Mack's managerial tenure in Philadelphia. The normally austere Athletics uniforms literally took on new color for that one season as part of the team's celebration. Also, for the first time since 1927, the elephant was returned to the uniform as part of a commemorative sleeve patch. Interestingly, the team name—"Athletics"— didn't appear on the team's uniforms until their final season in Philadelphia, 1954. Team owner Connie Mack's half-century run as manager came to an end after the aforementioned 1950 season. Several disappointing years, combined with cutbacks in team expenditures and Mack family ownership discord, led to fan apathy. After the conclusion of the 1954 season the Athletics moved to Kansas City. When the franchise moved to Kansas City in 1955, they arrived with a refreshed elephant logo and a new set of uniforms. The new emblem bore a close resemblance to the one that represented them in Philadelphia, but instead of a baseball curled in its trunk, the new logo featured the elephant clutching a baseball bat, balanced atop a baseball. The Old English "A" was still there, a tangible connection to the team's earliest days in Philly. The new uniforms were decorated with red "Athletics" script, both at home and on the road. Also gracing the uniform was an elephant—once again in the form of a sleeve patch. The play of the Kansas City Athletics was no better than that of their Philadelphia predecessors. Within a few years of their arrival, local politicians grew vocal in their efforts to retire the elephant in favor of a more relevant local symbol. On January 20, 1961—the day that John F. Kennedy was inaugurated as the 35th President of the United States—the Athletics announced that they were retiring the elephant logo from their uniforms. Additionally, a city name would be added to the team's road uniforms for the first time in the history of the franchise. 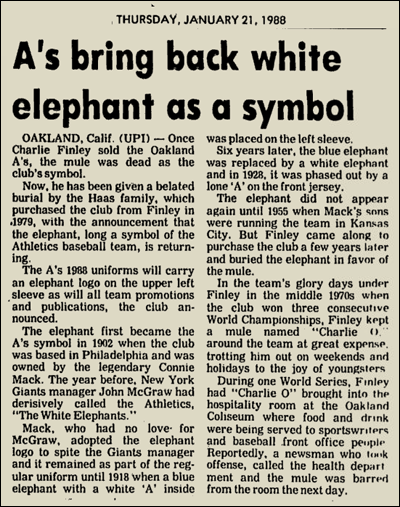 The A's dropped their elephant mascot altogether in 1965 in favor of a Missouri mule, named in honor of team owner Charles O. Finley. This seems ironic, considering the political sentiments expressed only four years before. Finley had reimagined the team uniforms two years earlier, outfitting the club in green and gold, a revolutionary move that further served to distance the franchise from its Philadelphia roots. In 1968 the team was once again on the move, this time to Oakland. A talented nucleus of young players began to emerge at this time, something that certainly did not happen when the club moved from Philadelphia to Kansas City 13 years earlier. The Athletics—more commonly known as "A's" during this era—won three consecutive World Series titles in 1972, 1973, and 1974. History repeated in the late 1970s. The club fell on hard times and Finley once again sought a franchise shift, this time to Denver. That fell through, and the team was sold to Walter A. Haas, Jr., president of Levi Strauss & Co. The A's enjoyed a successful first season under new management, finishing strike-split 1981 with the best record in the American League. A few more lackluster years followed, and in 1987 the team went back to basics, aesthetically speaking. New uniforms were unveiled which featured script "Athletics" letterforms, dark green trimmed in yellow gold. The typography was very reminiscent of the old Kansas City Athletics uniforms worn decades earlier. Abandoning all traces of modernity, the club reintroduced button-down uniforms and belted pants, arguably the most traditional look that the club had sported since the early days in Kansas City. In early 1988 the Athletics announced that they were returning the elephant to their uniforms for the first time since 1960. This return to tradition coincided with a new golden era for the A's, culminating in (yet another) three consecutive World Series appearances, starting that season. The elephant has remained a vital piece of the team's visual identity ever since. One can drive from the site of A's former home in Philadelphia at 21st Street and Lehigh Avenue to their current home, the Oakland Coliseum, via Kansas City. The trip would span 2,930 miles. It would also span over 110 years of Athletics history, the whole journey connected by a visual homage to an offhand insult, dropped to a group of reporters on a summer day in 1902.